admin January 22, 2018 December 2, 2018 No Comments on Untold Secret of Kitchen Remodeling Task! Where the kitchen is the heart of your home, designing the kitchen’s space should be remodeled by starting out with the basics. Here we’ll explain how. There needs to be a sense of fresh and comforting emotions when walking into the kitchen. The vibe should be inviting while making you want to cook when you walk in it. This is the kitchen vibe when you go in there, along with the aromas of fresh vegetables, herbs, and spices, including the aroma of a juicy rib-eye ready to be eaten. Besides smelling aromas which come straight from the kitchen during dinner time, you may want to just hang out in there even if you’re not eating or cooking. What plays the pivotal role are your senses when you walk into a room, regardless of what room it is, but in this case, it’s the kitchen. What is it that you or your guests feel when you enter your kitchen? A large kitchen with lots of light will make it look bigger. Thus, planning and lighting are two of the main things contractors look for when they consult with their clients. The comforts of walking into a home can be inviting or concrete cold. What is it that you want your home to feel like? The kitchen is one of the best spots to interact at. It serves as a comfort zone because of the universal need when we walk in it. Food brings us all together and with that said, consider your home remodeling by starting in the kitchen. After all, you may want some entrances straight to it from your room, or living room. 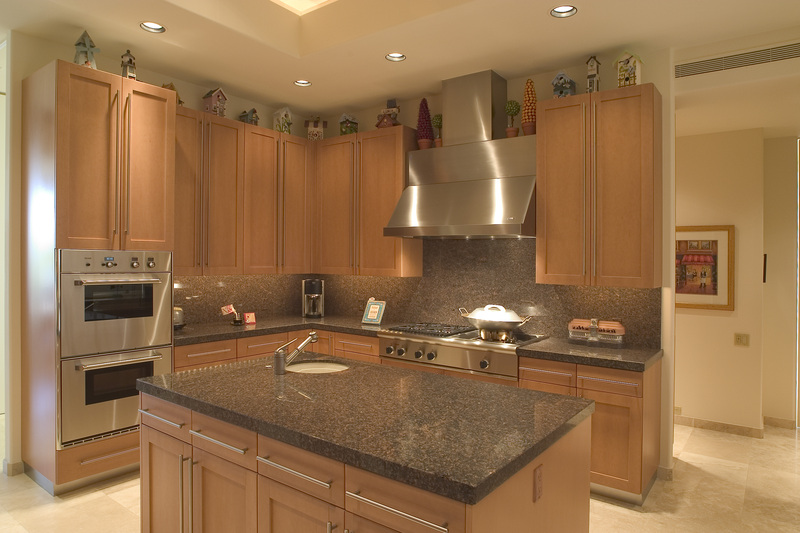 Appliances and dry goods storage are two main requirements for a home remodeling in the kitchen. The cooking area should be located toward the dining spaces, and the kitchen sink is best positioned between those two functions. Thus, it creates a triangle. The best work triangle is less than 21 linear feet (6.4 meters). A working triangle which is suggested by Houzz contributor, Steven Randel, a California licensed architect, in his article “Key Measurements to Help You Design Your Kitchen” (March 31, 2014). If you’re planning to renovate your kitchen, start with the basic design principles. Your culinary artistry will work a bit easier because of your overall kitchen design. In fact, it’ll improve how you cook, especially prepping your delicious recipes when those times arrive. Let the kitchen work for you. You’ll be able to operate more efficiently when the design of the kitchen floor plan is complete. In general, you want the design to play a huge role so you can function at your best when you operate in there. Those who do will have an easier time cooking, therefore you’ll be able too operate more logically when working in there too. Here’s what you should do when you decide to plan on your kitchen design with these three main elements for the design work. STORAGE – Vertical space for storage is a smart thing to add to any kitchen remodeling project. It’s just as important. It’s difficult enough to get that extra storage, therefore going vertical would help. It optimizes while increasing space. In fact, you can maximize your space from floor-to-ceiling. PREP AREA – You can build a gorgeous food prep containers in the center of the kitchen or against the wall. Some features that should be included are ceiling racks for pots and pan, shelves beneath the island and direct access to a sink which looks nice built-in the island itself. COOK AREA – The expansion of a kitchen should include the cooking space. With the addition of skylights, a beautiful landscape with the view of the outside. With windows, being able to view the outside is nice and can be a great way to make it look bigger by way of expanding to the outside because of the views. Finally, when you work out the planning for your kitchen remodeling project, there may be certain features you may want yet remember the budget. Budgets are critical to keeping you in line with what you can realistically afford. Besides, you can get away with many great looking accessories at a low cost and within quality means at major department stores and they won’t empty your wallets. What type of kitchen design do you have in mind?